A demon named Tripura performed a long and difficult tapasya and was granted a boon by Brahma. This boon made him very powerful and he conquered heaven. When the gods were driven out of heaven, They were helpless and went to Brahma for help. Brahma did know how to solve the problem and sent them to Shiva. 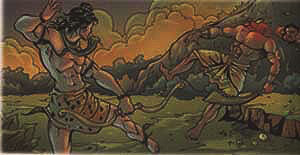 Shiva decided to help the gods and went to fight with Tripura. He killed him with an arrow. But while he was fighting a few drops of perspiration from his body fell on earth. Rudraksha plants grew in the places whrere the drops fell. The seed of the Rudraksha plant has a lot of religious significance . It is believed that counting the rudraksha beads while chanting Shiva's mantra cleanses a person of sin.